"Age doesn’t matter. Obstacles don’t matter. Winning is the challenge. Bottom line, inspiring others is the goal." "Before you can inspire with emotion, you must be swamped with it yourself. Your → vision statement should be short and inspiring. If you don't have a clear and meaningful vision statement today then pull together a team to construct one. Chose a vision that inspires and directs the organization. Ensure that it is broad enough to allow great flexibility. Communicate your vision to everyone in your organization and create an innovation-adept culture environment that encourages entrepreneurial creativity to make the vision a reality. 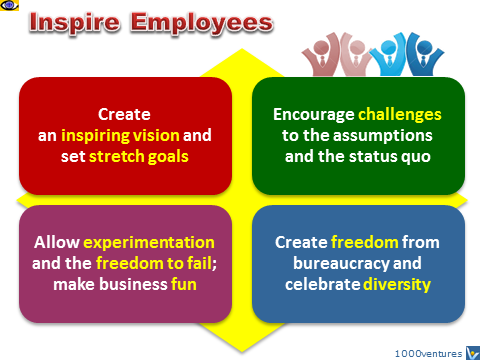 Effective leaders supply a shared vision and inspire people to achieve more than they may ever have dreamed possible. People change when they are emotionally engaged and committed. Leaders inspire people with clear visions of how things can be done better.